One important aspect to the Convention is technology transfer, which focuses on all parties working together to improve the development and transfer of GHG emission reducing technologies. This requires developed countries to step up with assisting in improving climate technology in developing countries. Along with its efforts to improve climate technologies, the United Nations Framework Convention on Climate Change (UNFCCC) has established a web-platform, TT: CLEAR, to publicly share all information surround climate technology including information on the Technology Mechanism. The Technology Mechanism was created in 2010 by the Conference of the Parties. It is comprised of two bodies: the Technology Executive Committee (TEC) and the Climate Technology Centre and Network (CTCN). TEC is the policy body which is made up of twenty technology experts from both developing and developed countries. They analyze policy issues and make recommendations to improve climate technology endeavors. Another role TEC has is to facilitate collaboration among these stakeholders to improve climate technology. Currently they are focused on six areas: adaptation technologies, emerging and cross-cutting issues, mitigation technologies, climate technology financing, innovation and technology research development and demonstration, and technology needs assessments. TEC works with stakeholders and partners such as NGOs, countries, intergovernmental and UN organizations, and experts and academia. The second body, the Climate Technology Centre and Network (CTCN), supports countries with the implementation of climate technologies,projects and programs providing assistance with technology solutions, advice on policy, and legal and regulatory frameworks. Developing countries can submit technical assistance requests which is one of CTCN priorities. The sharing of comprehensive, up-to-date, and easily accessible information on climate technologies is offered through CTCN’s TT: CLEAR. Since the Intergovernmental Panel on Climate Change (IPCC) describes ‘climate technologies’ as “any piece of equipment, technique, practical knowledge or skills for performing a particular activity that can be used to face climate change”, the CTCN does encompass a wide range of solutions (Climate Technology Centre and Network). Additionally, capacity building is another network service CTCN provides. Capacity building offers tutorials and workshops to peers and developing country stakeholders strengthening the collect knowledge of the network. CTCN is run through the UN Environment Programme and the UN Industrial Development Organization along with the support from 11 partner institutions. The centre exists on a network of multiple levels including the international, national, regional, and sectoral technology centres. For an example of the CTCN in action in Senegal this video explains how they took steps to better utilize waste and byproducts to improve productivity. Striving to quicken the shift to environmentally beneficial, low carbon technologies and climate resilient development, the CTCN carries out important work in addressing barriers that hinder development of climate technologies. The actions taken by the CTCN work to reduce the amount of GHG emissions emitted globally by targeting developing countries who all holding numerous opportunities for environmentally beneficial development. Having systems like Technology Mechanism in place that check and improve existing system is important. Without these systems, inefficiencies would cause climate change conditions to be exacerbated. These bodies in the Technology Mechanism operate collaboratively to improve systems globally. Holding 11,501 information resources and supporting 350 network members, the TEC and CTCN services are extremely importance to lowering GHG emission and improving climate resilient development. “Climate Get the Big Picture.” UNFCCC EHandbook , United Nations Framework Convention on Climate Change, bigpicture.unfccc.int/. 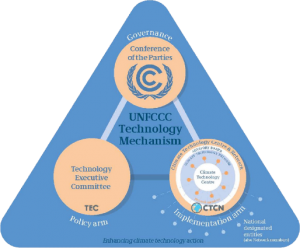 “Technology Mechanism.” TT:CLEAR, UNFCCC, unfccc.int/ttclear/support/technology-mechanism.html. “Climate Technology Centre and Network.” Climate Technology Centre and Network, United Nations Framework Convention on Climate Change, www.ctc-n.org/. This entry was posted in Risk and resilience and tagged Climate Technology Centre and Network, Technology Mechanism, Technology Transfer, UNFCCC. Bookmark the permalink.